Is the 4.7 liter a good engine? I went to Consumer Reports to check out engines since that is broken out more specifically. The engine is fine on this car, however, as with other Chrysler products, there are other things to worry about that break frequently. This includes problems with the transmission, problems with electronics, and problems with in car electronics. This exists on cars built all the way through 2015. So for the first two or three years of a new car they are pretty solid, but longer term, those are the things you have to look out for. So for short term leases or if you buy new cars frequently, it is fine. For a ten year ownership with few issues, you need to look elsewhere. Disagree with the above, and I have real experience as I still own a 2000 grand cherokee lerado with the v8. it now is passed to my daughter whom has driven it over 100k during 8 yrs of college and now has 235k+ plus miles on it and it is still tight, quiet and reliable. never had any transmission issues, zero electrical, hvac, windows, leather power seat motors and heaters...nada, nothing. The engine had a known sludge issue so chrysler cleaned the engine under the 100k warrantee and then we have used mobile one high mileage oil ever since and the engine is still spotless, at least looking at the valve train via the oil cap. we had to replace corroded brake lines on the rear about 5 years ago, new e-brake cables once, water pump has been replaced and the thermistat and hoses were done for good measure as it had over 100k on the odometer at the time. spark plugs twice and the front trailing arms for the live front axle were replaced as the bushings were shot, the shocks have been replaced andthats it, under 2k in repairs in 18 yearsand 235k miles. It is still on the road running great for my daughter who will graduate in a couple weeks after 8 yrs of college and she has not mentioned replacing it, she loves it and keeps it like new inside and out. No rust through yet and the white paint still shines. So thats a real world experience with 18 years of ownership. EDIT; I forgot that we replaced the windshield because it was badly pitted...that was just before my daughter took posession in 2010...I believe it was about 300 dollars. My Mom's friend bought low mileage 2004 Laredo back in 2013 or so. 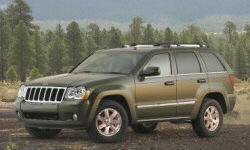 That was the last year for thay model and probably the best Cherokee ever. I'll chime one year after the OP and comment about my experiences with the 4.7l engine in my 2004 Grand Cherokee. Better yet, look in my garage for the list of repairs & maintenance for my Jeep over the last eight years of ownership. All vehicles have issues but good common sense maintenance will definitely help all the systems in your vehicle run efficiently and extend the life of your vehicle.